Providing a suitable environment for microorganisms to treat wastewater is what aerobic treatment units (ATUs) are all about. These advanced systems outshine alternatives on tight lots where there is no room for conventional treatment and on sites with poor soils, shallow vertical separation distances to limiting conditions, and horizontal setback restrictions. Some systems can be designed for the treatment of high-strength wastewater or where total nitrogen removal is required. The effluent produced by an ATU is a higher quality than septic tank effluent with significant improvement in biochemical oxygen demand (BOD), total suspended solids (TSS), ammonia reduction, and, in some instances, total nitrogen (TN) removal. With mechanically induced aeration and mixing within the unit, oxygen concentrations of about 2 mg/L or 2 ppm are achievable. This oxygen and mixing enables the microorganisms to break down the organic portion of the waste. In suspended growth systems, the microorganisms are free floating in the treatment zone, forming a mixed liquor that contains microbes (both dead and alive) and inorganic and organic material. Mixed liquor suspended solids (MLSS) is a measurement of all the material floating in the reaction chamber, including the microbes (alive or dead) and any inorganic suspended materials. In a typical activated sludge system, a healthy MLSS is in the 3,000 to 6,000 mg/L range. In a fixed/attached growth system, the microbes are attached to a plastic or inert media and the MLSS is not typically measured. Air enters the system and brings food to the attached microbes as the submerged media provides the saturated environment for biofilm to grow. As the biofilm gets dense, it falls off the media and is replaced with new growth. Relatively new to the industry, MBRs provide exceptional treatment via suspended growth treatment and use of a membrane material. The membrane cassette or module is place directly into the MLSS and the effluent moves from the mixed liquor, outside the membranes, to a void space inside the membranes and is then discharged. The very small holes in the membranes enable the mixed liquor to remain in the system. This results in an effluent very low in five-day BOD (BOD5) and TSS that is disinfected and nearly completely nitrified. Just like any living thing, the biology in the ATU needs certain elements to live and perform properly. Water is the universal solvent and is a hydrolyzing agent allowing things to be broken down. Air is introduced by the ATU to provide the bacteria with necessary oxygen. Energy is needed for the various microorganisms in the system. Some bacteria use carbon for their energy (heterotrophs), while others make their own energy from other substances (autotrophs). Nitrogen is used for protein synthesis. Protein is the building block of all living things. For every 100 mg/L of BOD5 the treatment unit needs to remove, 10 mg/L of nitrogen and 1 mg/L of phosphorus are necessary for microbial growth. Stable nitrogen and phosphorus levels are required to support the bacterial population. Whether a residential or commercial system, design is key to the longevity and sustainability of the ATU. In addition, having a good site plan, installation guidance, a plan for educating the customer, and a strategy for O&M is very important. There are different entities that certify ATU systems for residential use. In the U.S., typically the American National Standards Institute and National Sanitation Foundation (ANSI/NSF) standards are used. Systems are certified to remove BOD, TSS, and/or total nitrogen (TN) to achieve residential-strength wastewater treatment levels prescribed by regulations with flows ranging from 400 to 1500 GPD. 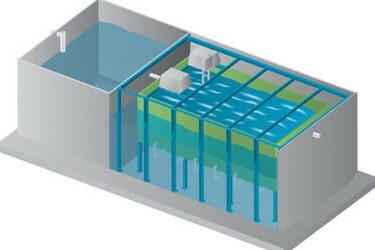 Commercial or large ATU systems have differing influent constituents than those set forth in the ANSI/NSF standards and often require a “treatment train” that includes things like flow equalization for facilities that have highly fluctuating flows or a grease interceptor for facilities that have grease in the waste stream. Choose a proven system for the application and system size. For systems that are expected to achieve high effluent BOD, TSS, and/or TN removal, the influent flow (volume and schedule) and strength are the most important pieces of information to obtain. For single-family homes, double-check the flow dictated by regulation so the appropriate model number of the ATU is applied. Commercial or large ATU systems have differing influent constituents than those set forth in the ANSI/NSF standards. A more thorough design and product evaluation is required. The system may require a “treatment train” that includes multistage treatment processes. Provide all information to the system manufacturer you choose to enable them to recommend an effective treatment plan for the application. Incorporate flow equalization into your design for systems with sporadic flow or strict effluent requirements. Manufacturers can help determine if the application or effluent requirements would benefit from having flow equalization added to the design. Some jurisdictions require flow equalization on every unit, including individual homes. Understand potential treatment issues in commercial applications such as a church where the system is only used a couple of days a week. Consider the effect temperature can have on the system and design accordingly. Cold temperatures can cause a loss of treatment, especially with nitrification. Hot temperatures in desert areas like New Mexico and Arizona can influence sludge settling and proper microbial growth. Burial depth and blower placement are important in both conditions. Understand the chemicals and medications used at the site and how their presence in the influent can disrupt the microbes. Discuss system operation with the owner/operator, including restrictions on chemical use such as cleaning fluids and sanitizers with quaternary ammonia as the active ingredient. Explain how medications can affect the system. Antibiotics and pharmaceuticals can be used in homes but can be a special problem in places like nursing homes, assisted living facilities, doctors’ offices, and critical care facilities. To obtain more info about what chemicals are in certain products, visit https://householdproducts.nlm.nih.gov/index.htm. Implement O&M access into the design and specify the use of a trained operator. Provide training on system mechanics, specifications, and location of buried components. Specify sludge measurement and removal as part of O&M. ATUs do require maintenance due to moving parts and conditions required to keep the microbes healthy. The biological sludge byproduct also accumulates and must be removed periodically to maintain system performance. The amount of oxygen diffusion achieved by an ATU depends on the surface area of the air bubbles. Fine or small bubbles with the same total volume of air as course or larger bubbles have greater surface area and are more efficient at getting the air into the water. In wastewater treatment calculations, the type of diffusion is directly related to the efficiency rating and sizing. Course bubble diffusion does have applicability in designs like high-strength waste treatment. The food-to-microorganism ratio (F:M ratio) is a key to good treatment. An ideal F:M ratio supports all the life forms needed for treatment and creates MLSS that settles well in the clarification process of a suspended growth system. 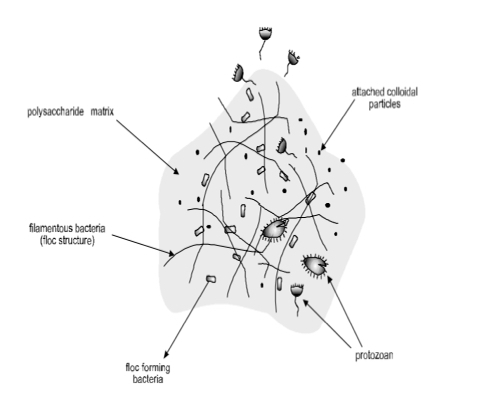 Unsettled microorganisms can cause BOD and TSS to show in the effluent. Since there is typically no measurable MLSS in attached growth system, the impact of a fluctuating F:M ratio is not as problematic to the effluent. Nitrogen treatment is accomplished by microbes called nitrifying and denitrifying bacteria. ATUs designed for this purpose need to provide the right environment for each of these types of bacteria to do their jobs: nitrifying bacteria require oxygen and denitrification occurs where there is very little free oxygen. It takes time and temperatures at or above 50°F to develop nitrification bacteria. Consistent food is not required, but they do require alkalinity which is not always present in the source water and hence will need to be added. The nitrification process produces nitrate when the bacteria break down the ammonia molecule present in wastewater. 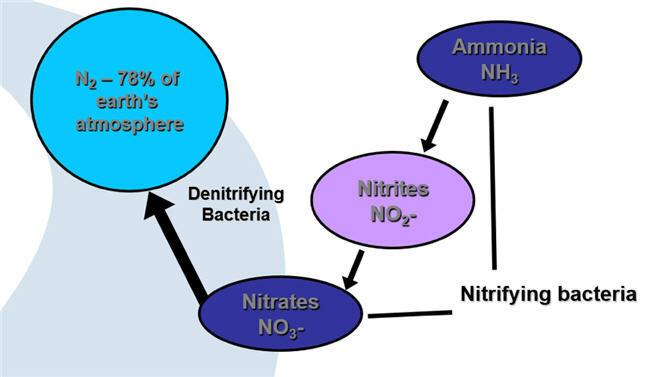 Denitrification bacteria need oxygen to survive, but with a low supply they will strip the oxygen off the nitrate molecule produced in the nitrification process. This will produce nitrogen gas that is released into the atmosphere. Denitrification bacteria also need “food” or an electron donor such as a carbon source. An electron donor may need to be added for a sustainable ATU if there is not enough to keep the bacteria performing as they should. Whether an ATU design is for a single residence or a larger commercial system, the designer must provide the customer with the right ATU system design for their application. Many times, an ATU is one of very few choices available based on the site limitations. When the initial price of an ATU solution exceeds customer expectations, it is key to make sure the client understands why it’s the best solution for their application. They also need to understand how the system works, what each component of the system does, the O&M obligations, and the role they play in its proper functioning. Allison Blodig (ablodig@infiltratorwater.com), REHS, is a biologist and has been working in the onsite wastewater treatment industry for 18 years. She is currently an Engineered Systems Specialist with Infiltrator Water Technologies, a leading developer of decentralized wastewater treatment technology.